Providing efficient and versatile granulation for a variety of applications, the 65 Series can be used with robot fed, conveyor feed, and hand feed operations. The 65 Series granulator also provides maximum cutting efficiency with their low-speed, 3 knife open rotor design. With cutting knives manufactured from D2 HCHC and heat treated with Cumberland’s proprietary process, the 65 Series handles virtually all types of molded plastic scrap. 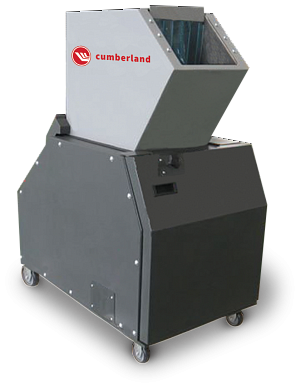 The Cumberland 1000X Series granulators are ideal for reject components from the injection, blow molding, and extrusion processes. The compact design makes them easily movable and the sound enclosure controls noise and permits access. Engineered for hand feed or conveyor feed, these granulators are packed full of standard features. 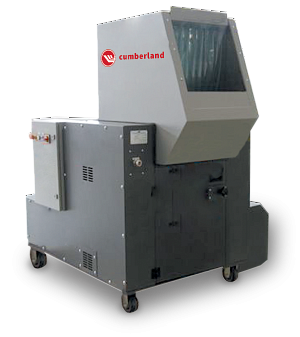 The Cumberland 1200X Series granulators are ideal for reject components from the injection, blow molding, and extrusion processes. The compact design makes them easily movable and the sound enclosure controls noise and permits access. Engineered for hand feed or conveyor feed, these granulators are packed full of standard features. With a horse-power range from 20 to 40 HP, and throughput capacities from 900 to 1500 lbs per hour, and a general-purpose, Cumberland’s 1600X series beside-the-press granulators are ideal for all of your specific needs. Cumberland’s 1600X series beside-the-press granulators provide excellent quality regrind and quiet operation, approximately 85 dba for most applications. The NEMA type 12 enclosure with 120V push button is designed to NFPA 179 specifications. Custom designs are also available. 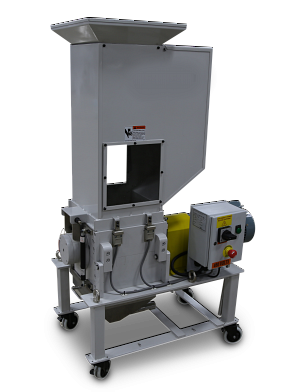 Auger-fed granulators feature a low profile design with an exclusive screen drawer and hinged lid, which provide complete chamber access for quick, easy clean out. The slant chamber design provides tangential feed from 3 plate molds, robots/sprue pickers, or parts separators. A full range of options are available to meet a variety of scrap recovery needs. Custom engineering and design services are available to analyze and provide specific designs when necessary, such as arrangements for robot or separator interface. Our fully equipped Customer Service Laboratory is available for testing and application assistance. Saving space and time, the S Series screenless feature eliminates the need to replace worn out screens. The compact footprint allows compatibility with existing equipment and reduces space necessary for most regrind applications and the quick-inspect hopper view window. Swivel casters allows for quick positioning in small areas. The S Series opens wide, exposing grinding chamber and blades and is designed for easy efficient clean out for material or color change. Interlocking front doors with tool-free access allows quick and easy clean out and maintenance, significantly reducing maintenance costs. Energy costs are also lowered with the S Series because of low cutting speeds. 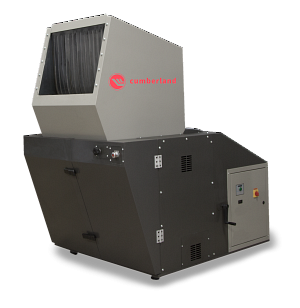 S Series Screenless Granulator by Cumberland is known for its high quality regrind in sprue and runner reclaim applications. The S Series Granulator reduces waste by providing clean regrind to reuse in your process. This compact footprint granulator will easily fit into your process flow.